Consider these tips to help protect your pet from a blustery winter. (Family Features) When temperatures drop, humans know to bundle up and avoid excess time outdoors. The same approach should be taken when it comes to pets. They may be covered by cozy fur coats, but not all of those coats are created equally. "Hypothermia is a real danger for pets in the wintertime, and despite pets' natural fur coats, it doesn't take long for hypothermia to set in and cause serious problems," said Jennifer Freeman, DVM, PetSmart's resident veterinarian and pet care expert. Limit walks in extreme cold weather and monitor your pet's behavior for signs of stress or discomfort. Never leave a pet outside during a winter storm. Do not let your dog off its leash after snowfall. Snow masks familiar scents and your pet may become lost and disoriented. Snow-melting products like deicers, antifreeze and salt can cause skin irritations and, if ingested, can be fatal. If you live in an area where these products are used, it's important to thoroughly rinse your pet's paws and belly after a walk. If your pet is small and short-haired, he or she is likely sensitive to the cold. The same goes for older pets and those that may be frail or ill. You can't take your pet's temperature by touching its nose, but a shivering body means he or she needs a sweater. Larger and long-haired pets can usually tolerate cold weather for longer periods of time, and even though you might bundle up, your pet has a long, thick coat prepared for long winter walks. Just remember paws get cold and sharp objects may be hiding under the powder - consider putting booties on your pet's paws for added comfort. Many pets get dry skin during the winter season. When they do need a bath, try using a pet-friendly moisturizing shampoo to help keep their skin healthy and pH-balanced. Emergencies can also create circumstances for pets to become separated from their families. In addition to ensuring your pet is wearing a tag with your cell phone number along with microchipping and registering him or her with current contact information, also tuck a copy of your pet's vaccination and medical records, veterinary contact information and a current photo of your pet in your emergency kit. 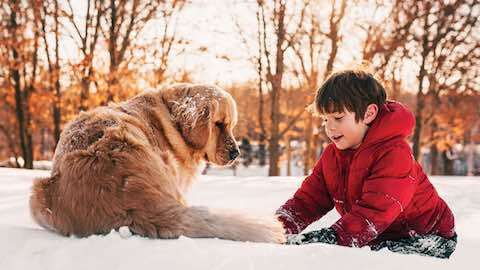 Dogs & Puppies: "Help Pets Ward Off Winter Risks"